Gone, but likely never forgotten. That’s the legacy left behind in Liberia by the 5th China Formed Police Unit to United Nations Mission in Liberia (UNMIL). CGTN Africa spent a little more than a week with this team gaining insight into the challenges the unit faced during their time in Liberia. Along the way, the members of the unit earned appreciation from the people they served, made life-long friends within the community and won respect and admiration from their comrades and commanders in the peacekeeping force. “Chinese FPU represent high quality of professional competence, very disciplined, well trained and very committed to their task”, said UN Special Representative of the Secretary-General, Farid Zarif. UNMIL Police Commander Simon Blatchly told CGTN that the technological advances and quality of equipment introduced in Liberia by the Chinese exceeded the standard provided by most other formed police units. Blatchly says the Chinese broke new ground working alongside a peacekeeping unit from Nigeria. The Chinese peacekeepers also trained a 150-person formed police unit for Liberia National Police and provided support to help them. “Before their arrival, our equipment was substandard,” said Liberia National Police Commissioner, A. Ebreem Deline. This year will mark 15 years since the end of Liberia’s brutal civil war. 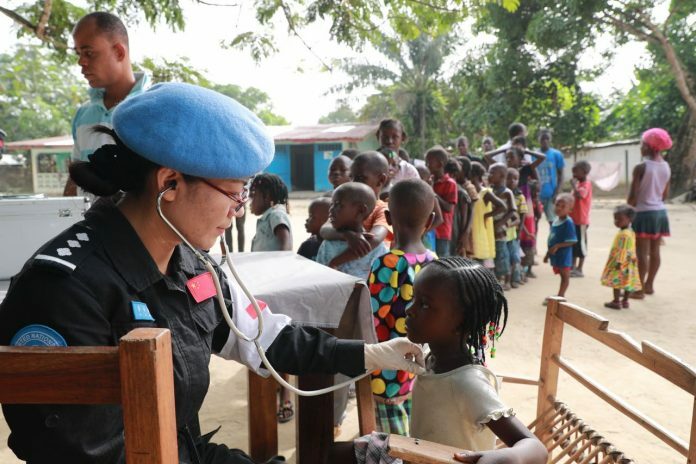 The west Africa is still struggling but China, through the efforts of the 5th China Formed Police Unit to United Nations Mission in Liberia (UNMIL) is helping Liberia recover. The peacekeepers’ main mission was protecting civilians and each other. But the Chinese team achieved far more than that. And in helping Liberia heal itself they offer citizens hope for a brighter future for their country.